I’m not normally one to dedicate an entire post to praising a company for their customer service, mainly because I don’t frequently experience the type of service that deserves public recognition. This is an exception. 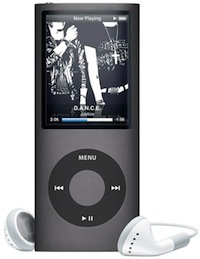 In February of this year, I won a 16GB iPod Nano (4th Generation) in an online blog contest. It was sent out to me the next day via FedEx and all was well in my world. I didn’t use it right away, because I already had another iPod with all my music on it. I left the new one in its packaging until earlier this month (December 16 to be exact). I had forgot about the new one and thought I should try it out, so I unpackaged it and put some tunes on it. The next day, it wouldn’t turn on, even though it had charged for 5 hours the day before. I tried resetting it, but there was no power getting to it. I searched for some fixes online and found out it may be a faulty battery — which was odd, because it was only my second day using it. Because it was still under warranty for another two months (February 2010), I put in a support ticket on Apple’s website for a repair on December 18. By December 21, FedEx was at my door with an empty box from Apple, which contained some padding, a little plastic bag for the iPod and a note with instructions. They basically said put the iPod in this box, tear off the first sheet with pre-paid postage and mail it back to us free of charge. I mailed it on December 22 and by December 24, FedEx was at my door again, but this time with a box containing a completely repaired iPod. I opened it up and noticed the serial number was different than my previous one. Apple simply replaced it with a brand new unit instead of fixing it. Awesome! Keep in mind, that I shipped the product back to an address in Ontario, Canada and the new one came from Pennsylvania in record time. This was my first experience with Apple where I needed to have something repaired and they did a top-notch job. The warranty on my new unit is valid for 90 days. I hear the horror stories from others that deal with Apple customer service, but in this instance, I didn’t actually speak to anybody. Simply filling out a repair form on their website and following the procedure to have the situation rectified scored me a new product in less than a week! Thanks, Apple. That was like an early Christmas present.